Having followed the traditional cycle of album/tour/album/tour – with the emphasis on the live side of their activities – for the past 12 years, Atlanta riot grrls The Coathangers took some rare time off last summer to recharge their batteries, re-evaluate their position and, in their own terms, reconfigure their sound, re-emerging from this self-imposed hibernation with this new collection of 11 songs, just released by Suicide Squeeze Records. The result is a cohesive and considered collection that lies somewhere tween and twixt the feminist agit-prop of Blondie, Hole and L7 and the spunky alt-punk of the likes of The Minutemen and The Pixies, with references to the latter especially evident on the likes of the ‘Crimson Telephone’ (a critique of today’s social-media led society). The trio manage to merge a sound that at times sound so innocent and sugary sweet and yet contains an underlying acidic fury, especially in its lyrical themes: imagine Claire Grogan having the mic grabbed from her grasp by Courtney Love or Dolores O’Riordan after the opening verses of the likes of ‘Hey Buddy’ or ‘Step Back’. 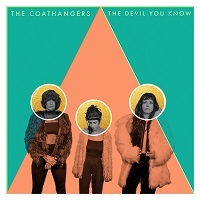 ‘The Devil You Know’ is an extremely socially aware album which masquerades as harmless power pop: but, as with all the best examples of the genre, the messages in the songs punch through and worm their way into your sub-conscious with a sense of commercial viability: ‘F The NRA’ has an obvious target for its lyrical vitriol, but at the same time will fill dancefloors at whatever venues they play it in. If you like your punk covered in the oil from the garage floor, yet packed to the gills with infectious choruses and earworm hooks, then ‘The Devil You Know’ is straight up your back alley and should be an essential purchase – as should tickets for their forthcoming tour dates, as outlined below. ‘The Devil You Know’ is out now. You can get your copy HERE.